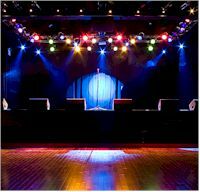 The Highline Ballroom is a 700-capacity standing, 400-capacity fully seated venue located in the heart of Chelsea. Long known as the artistic heart of New York replete with its artist lofts, gallery spaces and charm, the Chelsea neighborhood was the perfect location choice for the space. Nestled beneath the High Line, a 1.45-mile-long elevated public space complete with landscaping and viewing outposts that runs through the West Side neighborhoods, the Ballroom boasts a state-of-the art sound and light system, a balcony, seated wings and a variety of floor setups. The venue�s pristine production quality allows for superstar stadium acts to play a more intimate show for their fans without compromising the level of sound or performance. The Highline Ballroom is one of the top New York City venues for concerts and other events. Don't miss some of the biggest names in music as they come to New York City area's Highline Ballroom to perform live.